In the town of Umm al-Fahm, more than a third of all letters never reach their destination. Identity cards, passports and drivers’ licences go missing, welfare cheques are lost, appointments expire, and penalties mount up over unpaid fines. For decades Umm al-Fahm’s 301 streets have lacked any names or house numbers. But five years after the municipality submitted a list of names for every street, Israeli government officials are still dragging their feet. They have not yet given an official reason, but there seems little doubt about the cause of the interminable delay. The names of some 40 streets – including a Yasser Arafat Street – have enraged Israel’s right wing government. Umm al-Fahm is the second largest Palestinian community in Israel, after Nazareth. About a fifth of Israel’s population are Palestinians, remnants of communities that were not expelled during the Nakba – Arabic for “catastrophe”, the word Palestinians use to describe the creation of Israel on the ruins of their homeland in 1948. But for decades, many Palestinian communities in Israel have been left in a kind of bureaucratic “dark ages”, noted Yousef Jabareen, a Palestinian member of the Israeli parliament who lives in Umm al-Fahm. The cause, he said, was a combination of a lack of budgets and the interior ministry’s refusal to countenance street names for Palestinian political and cultural icons. “This goes well beyond a technical matter of problems finding where people live and sending mail,” Jabareen told Middle East Eye. Last year, the village of Jatt, near Umm al-Fahm, ran into similar difficulties. The municipality was forced to take down signs on a street it had named for Yasser Arafat after Israel’s prime minister, Benjamin Netanyahu, declared he would not allow any street to bear the late Palestinian leader’s name. Matan Peleg, head of Im Tirzu, a far-right group that originally raised the matter with the government, argued that “Arafat’s hands are stained with blood” and called the street signs a “disgrace”. But Jabareen countered: “Yasser Arafat was a partner in the [Oslo] peace process, he won a Nobel peace prize, and he was the internationally recognised leader of the Palestinian people. Among the other 40 proposed names that have been rejected for Umm al-Fahm are Mahmoud Darwish Street, for the Palestinians’ most famous poet; streets honouring previous mayors of the town; and a handful of streets named for villages razed by the Israeli army during the Nakba and from which many of Umm al-Fahm’s families were displaced. An objection has been raised too against a street commemorating 30 March, the anniversary of Land Day in 1976, when Israeli soldiers shot dead six unarmed Palestinian demonstrators during protests against the state’s confiscation of their lands. Land Day is marked by Palestinians around the world. Although other Palestinian communities lack street names, the situation in Umm al-Fahm is especially acute, noted Jabareen. Almost all residents belong to one of only four extended families: Aghbariyeh, Mahajneh, Mahamid and Jabareen. With potentially hundreds of Mohammeds, Mahmouds and Ahmeds in each family, finding the right person without an address often proves impossible. In response, Adalah, a legal centre for Israel’s Palestinian minority, sent a letter last month to Aryeh Deri, the interior minister, as well as Israel’s chief law officer, Avichai Mandelblit, demanding that the street names be approved. According to Adalah, the interior minister has exceeded his legal authority by blocking the names, effectively holding the town to ransom. She said the ministry was able to exploit its position because municipalities were dependent on the government for part of their budgets and for services. The interior ministry, however, denied that it was overstepping its authority. “The ministry is allowed to examine, and in some cases even to intervene, in a decision by a local authority to decide on street names,” it said in a statement. Without addresses, Umm al-Fahm’s residents have had to rely on postal boxes. But the Israeli authorities have failed to provide enough boxes, leaving thousands of families without an address. In Israel’s largest Palestinian city, Nazareth, most streets also lack names. It has avoided the interior ministry’s stranglehold by issuing many streets with numbers instead. Palestinian leaders in Israel have accused the interior ministry of a double standard, noting that a large number of streets in Jewish communities bear the names of controversial historic figures. Some were viewed as “terrorists” either by British Mandate authorities that ruled the area before Israel’s creation or by Israel’s founders themselves. The towns of Or Akiva and Ashkelon have named streets for Rabbi Meir Kahane, whose vehemently anti-Arab Kach party was listed as a terrorist organisation by the FBI. One of his prominent followers, Baruch Goldstein, an Israeli army doctor, massacred 29 Muslims at worship in Hebron in 1994. Many streets bear the name of two pre-state paramilitary groups responsible for killing civilians: the Lehi and the Irgun, also known by the Hebrew acronym “Etzel”. The Irgun famously blew up the King David Hotel in Jerusalem, killing 91 people, and carried out the Deir Yassin massacre, the most notorious single attack on a Palestinian community during the Nakba. It led to mass flight by Palestinians from their homes. Lehi, meanwhile, regularly mounted lethal attacks on British soldiers and had a history of killing Jewish women who dated them. Its leader, Avraham Stern, known by the nickname “Yair” was the inspiration for a new town dedicated in the early 1980s, Kochav Yair. Stern also has streets in his honour in many towns, including Petah Tikva and Kefar Sava. Former Israeli prime minister Yitzhak Shamir, who has streets, schools and medical centres named after him, was commander of the Lehi in 1948 when it killed Folke Bernadotte, a mediator in Palestine for the United Nations. 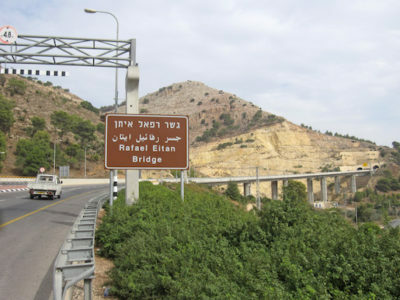 And when an elevated road to Nazareth was opened a few years ago, Israeli officials named it “Rafael Eitan” bridge, despite vehement objection from city leaders. Eitan, an Israeli general, famously advocated treating Palestinians like “drugged cockroaches” and founded an anti-Arab party. Like the residents of Umm al-Fahm, some 330,000 Palestinians in occupied East Jerusalem have faced a series of battles over street signs. Israel has been gradually replacing road signs using the Arabic term for Jerusalem, “al Quds”, with the Hebrew name “Yerushalayim” transliterated into Arabic. Writing on the Israeli website Haokets, a Palestinian researcher of the Nakba, Umar al-Ghubari, observed that the Israeli authorities had erased Palestinian signs to make Palestinians “feel foreign” in their homeland. In recent years East Jerusalem has started being issued with its first street names after a leading human rights group, the Association for Civil Rights in Israel (ACRI), petitioned the Israeli supreme court over the lack of postal services there. But Nisreen Alyan, a lawyer for ACRI, said East Jerusalem’s Palestinians had been forced to restrict the names to flowers, animals and stars to get them approved. “It has taken more than 40 years of struggle to get street names for East Jerusalem,” she told MEE. Even so, observed Alyan, 30 streets were awarded Hebrew names by the Jerusalem municipality, highlighting Biblical and Jewish connections. These were mostly in Palestinian areas such as Silwan and Sheikh Jarrah, where Jewish settlers are trying illegally to take over homes and land. Ahmed Tibi, a Palestinian member of the Israeli parliament, warned at the time that the measure was part of “ongoing efforts to Judaise al-Quds and falsify history”. Alyan said it was important to put the problems over signs into a wider context. Most Jewish communities and public institutions had avoided translating Hebrew signs or documents into Arabic, even though Arabic is an official language and the mother tongue of a fifth of the population. She noted that there had been a storm of protest recently after a popular TV show, Fauda, about Israeli soldiers operating undercover in Palestinian areas, put up billboards in Jewish communities promoting the programme in Arabic. The posters had to be taken down. “Right now there is a struggle over the status of the Arabic language in Israel,” she said, referring to a Basic Law the government is currently drafting to declare Israel as the nation-state of the Jewish people. This article was posted on Saturday, March 17th, 2018 at 7:07am and is filed under Discrimination, Israel/Palestine, Jerusalem.